My name is Mike Bates and this is just a few of the memories of the time I spent in the village. 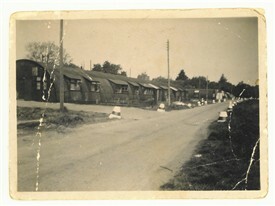 I was about two (approx 1948) when we moved in Nissin Hut 105 Hothfield common. Mum, dad and I moved up from Peasmarsh in Sussex. Our Hut was more or less in line with the phone box and bus stop on Maidstone road. As far as I can remember it had a kitchen dining room with an aga. My cot is in the corner by the door leading to my parent’s room there was a further room were as I got older my brother and I (he came to live with us when I was six or seven) used to sleep. I remember it was very cold but it did have a wood burning stove in there. The Hut had a corrugated roof with asbestos sheeting as walls and a brick surround. There was a shed on the side where we kept the coal and wood for the fire and next door was an outside toilet which was cold and damp. In those days everyone used a guzunda I think the rent was about ten shillings a week. We did live in Hut 112 at first but I was too young to remember that. When the village was built the council came and knocked all the Nissen huts down. I have some photos of me on a trike I was about three at the time, and a couple more of some of my friends. Gerald Pearce who lived a bit further up in the woods, Terry Popham (he had a sister called Cynthia) another was David Sharman and Tom Burtonwood (he was ten years older than me and went into the Navy). There was a posh house behind our Hut that had a long drive but I can’t remember who lived there. There was a Colonel Sizer who lived on the road to Hothfield railway station towards Westwell. Benton’s farm was where we went for fresh milk and butter which was made on the farm. The ice cream van used to visit the camp once a week (Toni’s I think) and the A1 fish and chip van parked in the bus stop lay-by once a week as well. We has Sunday school in one of the Huts along Cade Road and I remember going to primary school and hearing the explosives as they blew up the tree stumps. All the school children were given a coronation mug and a coach and horses to celebrate the Queen’s coronation 1953. I remember riding on an open back lorry taking all our belongings to our new house. It was a first time I’d seen an inside toilet that flushed and a proper bath. It had no central heating just a Rayburn in the kitchen and an open fire in the front room and of course we didn’t have stairs in the Huts. There were three bedrooms so I had one to myself. No washing machine all the washing was done in the sink, no fridge the milk was put into a bucket of water to keep it fresh. Mum had to do the shopping in the village every day, she used to put money for bills in separate tins i.e. rent, milkman, coal man, insurance man. The garden was just mud and rocks with a telegraph pole just outside our backdoor, the fences was just concrete posts with a couple of pieces of wire strung across. The road wasn’t very long it only had about eight houses at first, at the bottom of the road it was covered in bramble bushes. They eventually built bungalows and garages there. After a few years they renamed the road as Plantation Close and our house became number 1. I can remember mum putting a house brick in the oven and would cover it in brown paper then put it in the bed to warm it up for us (no electric blankets or hot water bottles). In the winter we had a fire in the front room from wood we brought in from the woods and logs when we could afford them. In the early days the village children were taken for a coach trip to the seaside paid for by a trust fund founded by Lord Rootes, the mums and children would meet outside the village hall about seven-thirty in the morning and off we would go for the day. We went to Margate (Dreamland) twice, once to Ramsgate and once to Southend. As most kids we went to Saturday morning pictures at the Odeon Ashford it cost 3d I think. It was always packed with queues right down the high street. Mrs Tufton used to have fetes in her garden one year it was in the field opposite her house and they had coconut shies, another year it was held in the park near Lord Rootes’s place. During the summer when I was quite young mum and quite a few from the village used to go apple, strawberry, potato, and hop picking. Some years on November 5th the village lads would build a bonfire and the parents would bring potatoes and fireworks, some years we would go up to the Boy Lands place (the football pitch is there now). August/September mum and I used to walk to Westwell and back collecting blackberries and she would make blackberry and apple pie. Other meals I remember were bubble and squeak (cabbage and potato fried) Rabbit stew, homemade bread and cheese and condensed milk sandwiches. The Corona drinks lorry would come around once a fortnight, a rag and bone man with a horse and cart came round quite regular. 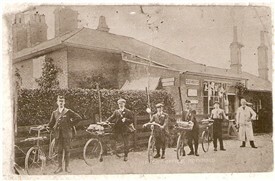 The number 10 bus was on the main Ashford Rd then, but if you were lucky the number 49 used to go through the village. I would try and catch the 49 when I stayed behind at school because I had to walk from the main road to the village in the dark because there was no street lights. At Christmas a lot of the village lads met by the church, and the local farmers used to pick us up in a cattle truck and drop us off near to various woods we had to walk through the woods making as much noise as we could to scare the pheasants out in front of the men with guns, we stayed out for hours and were paid ten shillings and got a bottle of pop each as well. We used to go ferreting in the woods at Benton’s farm or on the common. We couldn’t afford proper cycles so we used to go Great chart dump and get the frames etc and make our own, we also made carts the same way pram wheels were the best. We used to ride our bikes down to watery lane towards Westwell and wait under the railway bridge until a train came past as it made a lot noise. I’m sure one year the station itself caught fire and one year one of Cole’s farm barns caught fire and half the village came to watch. As kids we used to go past the Ridley house on the main road to Ashford just past the bus stop and go scrumping. In our teens a few of us would go camping in the woods or on the common, it was always cold and damp. My auntie Alice used to live in one of the houses down there it was later demolished and she moved to Thanet Terrace. We used to leave our bikes down there and walk to the river and go fishing. There was a dump on part of it just off Cade Road. Prince Charles came to look at the conservation area that was created. Also the army used to use it for training exercises we quite often found a lot of empty bullet cases. There was also the sewage works where a young lad drowned, he must have been around eight or nine. This is where we rode our bikes it was a big dip between Station road and Cade Road. The hospital lake had a boat house lots of fish and we had to get written permission to fish there. The Waterfall lake used to get frozen over and the local lads used to go there with their catapults and try and try and shoot the ducks as they tried to land but they never got any. The small river from the waterfall had sticklebacks and crayfish. And one winter the snow was so deep the road leading down to it was like a tunnel with snow over the top of the trees. They used to hold ballroom dances on a Saturday night. Quite a few of used to go, it was really boring (we couldn’t dance) and in the week the dance floor was taken up and the swimming pool underneath was open to the public, I think it cost one shilling. One was on the corner of Cade Road and School Road. I used to sit on the top and take car numbers I remember it really stank, the other one was up the hill past Coles’s farm on the left. Mrs Shersby was the junior teacher and I remember her playing the piano. Mr Upton taught middle school and looked after the football and cricket teams, he also painted fairy tale murals on the walls in green paint. Mrs Bottle was the head teacher done all subjects especially maths and English etc. Mr Purkiss took over when Mrs Bottle retired. Mrs Cox helped in the kitchen and with the children at play time. We shared the primary school with children from Little Chart they were brought to school in an old green van owned by Mr Acott. John Periss, Silvia Periss, Angela Gore, Victor Butcher, Vivian Butcher, Wendy Homewood, Richard Ayers, Robert Croft, Arthur Hulse, Wanda ? The Hothfield Men’s football team used to play on the green outside the school for a couple of years before moving to a field opposite Mrs Tuffton’s house and then finally moving to the field opposite the Boylans place. Arthur Baker was the football team manager when it was outside the school. Tom Dors was the first village bobby when we first moved in and he used to ride around the village on an old bicycle. Constable Spooner was the next one and he rode around the village on a silver velocette motorcycle. The cricket team started playing in the park by the church I think it was owned by Lord Rootes they then moved onto a pitch off Maidstone road for quite a few years, that’s when I started playing for them I was about 14. They had to move off that ground because Mrs Seabrooke (a probation officer) kept having her roof tiles and windows broken by the cricket balls. The team then played on Pluckley village cricket ground for quite a few years. Tamsett – Michael married Pauline Field and he also had a sister? Pile Family – Billy got run over and killed same place as Jeffery Sellen near garage Tutt Hill. Kathy Milies, she worked for Cole’s farm looking after the pheasant pensand her son Robin. She passed away one day while working with the pheasants. Jim Cunningham moved in after Mrs Miles passed away. 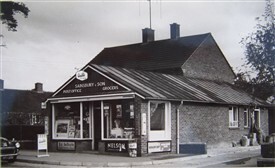 George Sainsbury and his dad owned the village shop for years, and then Dave Forman opened his shop further up the road on the left which was a bit like Woolworths it sold a bit of everything with everything. We used to get most of our Christmas presents there. His daughter married and moved to Australia. The old Village Hall was on the left that’s where the boys brigade and youth club was held (they had a barn up the road to the church to start with) and the youth club moved up to Tutt Hill on the road down to the hospital on the right. Maurice Millbury Steve and Pauline Jarman used to run it. Mrs Walters was the caretaker of the village hall and Pat and David Higgs lived in a house next to the hall and Vera Marsh lived opposite. A butcher shop was on the corner, Mr Giles I think. I can still smell the sawdust etc. He had a large tree trunk in the shop which he chopped the meat on. Rita Wilfred and Sandra Cox. Sandra was run over and killed whilst walking home through Station Road woods. Mr & Mrs Ridley lived on the main road to Ashford past the bus stop. Children were Brian, Peter, Ronnie, Joyce, Betty and Joan. I hope that this has been of some use to you. I have really enjoyed putting it all together. This page was added by Chris Rogers on 21/10/2013. What a great story. I grew up in Hothfield the son of Patricia Higgs. We lived in the house next to the original Hall [Post Farm]. I don't remember it having a name. it was the very old house and property behind and to the left of the old hall. I remember the old hall being torn down. A store was on the other side of the Hall.When i look on google now there seems to be something built to the left of the house, Garage ?My Grandparents would have brought the house in the mid forties, just after the war. They were Harry and Phylis HIGGS.They had three children David, Patricia and JENNYMy Aunt was killed a car crash in Ashford around 1970.I grew up in Hothfield from 1966 until we sold the house in 1977.My Mother and Uncle have lots of memories and photos of the house and Hothfield. I remember fishing in the Lake and banging on the little window in the back of the pub to get crisps ... I left Hothfield in 1977 to move to Canada. My Mother Patricia and her brother David still talk fondly about growing up in Hothfield. If you'd like to get in contact with Keith then he'd like to hear from old friends and neighbours. 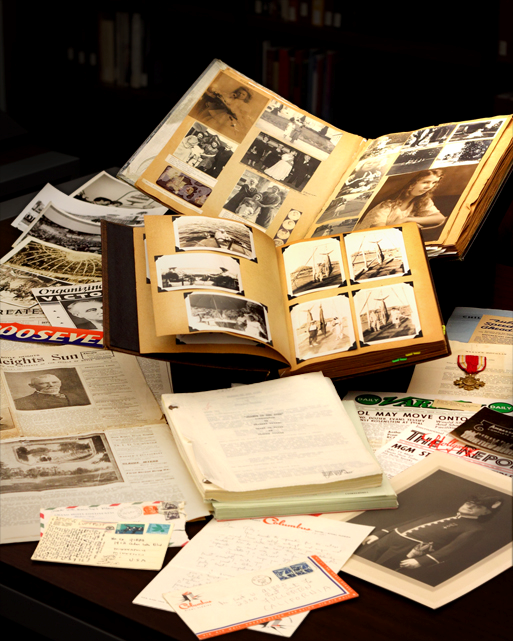 Please e-mail: hothfieldmemories@hotmail.com and we will pass on your message. "Camilla Brown she had polio and callipers on her legs." This sentence is not quite right. Camilla's surname was not Brown it was Broughton. She has a brother named Ian and the family moved to the Maidstone area in the late 50's early 60's. I live a few doors down from Camilla and her brother in Coach Drive with my brother Terry. I was very interested by Keith Palmer's comments. Along with Steve Matthews ,Robin Murrell and Acky Esposito , I was friendly with the Higgs family . David , Pat and Jennifer. A couple of years ago me , Robin and our partners went to Florida. Whilst there David and his wife Pat drove down from Pennsylvannia and spent a week with us. Before moving to that house ,the Higgs family lived near my partners Annette's family in Thanet Terrace. Very interesting read. I was born in a hut on the common in 1950. Moved to Charing soon after. Thanks for putting it together. Nice to read, my mother's maiden name was 'Higgs'. I remember her brother my uncle 'Harry' (I don't think that was his proper first name) and an aunt Phyllis from Hothfield. I also have memories of Jennifer who would have been the same age as me. Lots of other people names here I remember mainly through playing local football (60's - 80's) as I used to live in Charing. Great read, I have photographs of some of the names mentioned. I have been reading your pages on Hothfield and I see my name as Billy McGillan living in Common Way. We did live in Common Way but my name is Bill Gilfillan. I now live in Ashford and am married to Vivien Butcher from Pluckley. my partner , Annette (nee Allman) remembers Vivien from school. I believe she was a friend of my mate Ackys wife Christine. Very cool to read comments by Adrian Wells. My Grandparents were Henry (harry) Higgs and Phyllis. My aunt Jennifer died in a car accident in Ashford when I was very young. I remember names like Alan and Adrian Watson on Beach Drive and Gary Fowler lives by the pub. I remember head master Pepper and teacher Bowen. also Mrs Luckhurst. I remember being in the fishing club and all the other great things to do in Hothfield. Thank you for your most interesting story.When I got to whom lived in school road. I did at number 24 but I am Veronica not Monica a mistake that follows me often. You may remember my brother Michael(Mick) My mother Betty and my father Len. My parents, Pam and George McDouall, owned Kempton Manor for a few years in the late '60's and my sisters, brothers and I used to go to school in Charing. Mum would take us for picnic afternoons on Hothfield Common. Very interesting, thanks. My family moved from London to a flat in Thanet House when I was about 5 in the mid-50s; we were there for about 3/4 years. I used to leave my trike behind the grocer's shop before getting the bus into Ashford for school. I used to go in with Yola(nd?) and Margret Kawinska(?) - think they lived on Park Drive. Also I was friends with a lad Michael Clark (I think) who lived with his mother at Thanet House; also friends with the children of the gamekeeper who lived in the cottage at the end of Church Lane. I remember the butcher's shop - the primary school was close by. Also one of the Nissen huts was a grocer's shop when we arrived in the village. Gosh it's a long time ago! Ah! wonderful memories, I am David Sharman and i do remember living at Hut 103 Hothfield common and would have lived next door to you Mike, your memory is so much better than mine, I moved from London with my parents and elder sister Diane around 1950 to the hut, moved to 3 Common Way in the village around 1954,went to the village school, i remember the headmistress Miss Bottle, some of the names and places brought many nostalgic happy times flooding back, it was tough but so idyllic playing around Hothfield as a child, the photo of the party in the village hall i can see myself and my sister in i did have the same photo but has since been lost, thank you Mike for your wonderful article, if you wish to contact me let me know by leaving a comment on your page. and i will give my details. 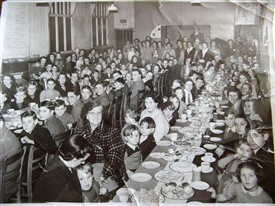 I used to holiday at the forge in the late fifties/early sixties until 1962 or 1963 (I was born in 1950). My father's uncle owned & ran the forge (although crippled with damaged hips ) & I used to watch him walk into the forge with 2 sticks, prop them up on the side of the fire & work all day standing. I think my father's uncle was named Cheeseman (this name sticks in my mind for some reason). Can anyone give me more info on my father’s uncle as I was told he was quite a good cricketer in his younger days? He had a son who worked for an engineering company in or near Ashford. I used to play with a boy (do not ask me his name as I have the worlds worst memory for names) who lived further down the lane. I can remember part of the orchard being sold to a petrol company for a filling station. The journey to get there from my home in South Wales was a nightmare (no motorways) leaving on Friday evening & getting off the bus outside the Woolpack at around midday Saturday. Another thing that sticks out is metal gates displayed outside the forge on the main road & the intricate designs of flowers & leaves on them. Hi, just an update - there was an Andrew Stickles that lived in Plantation Close , also i saw a mention of the Jobber family - an Alf Jobber used to lodge with Mrs Miles on Coach Drive i remember he used to play the accordian and appeared in one of the talent shows in the village hall. Ive also got a photo of myself with David Sharman and Terry Popham perhaps you could let them know i'd like to get in touch regards mike bates. Hi all! My grandad is Barry Bryant, who used to live on Beech Drive. It's been lovely to read this I will be sure to show him and ask him all about growing up here. Would be lovely if any one has any photos with him or his siblings? Very interesting site, thank you! I am related to the Harry & Phyllis Higgs family. I have lost touch with David, Patricia and other cousins. I live in Sherman, Connecticut now and would love to connect again. Mike ( Taffy ) Teesdale.